This article answers basic questions about how splices (connections between two or more electrical wires) are made to connect & secure electrical wires together in residential or commercial building electrical wiring systems. We also discuss the use of electrical splices or wiring connectors outside of electrical boxes. We describe different types of connectors used to join two or more electrical wires, and we include installation details inclucing use of electrical tape. Sketch at page top courtesy of Carson Dunlop Associates. TWIST ON WIRE CONNECTORS - "wire nuts"
Splicing electrical wires - that is, the electrical connection or joining of two or more wires that conduct electricity in a building - is a task that can be learned easily, but if the splice is not made correctly, the electrical system will be unreliable and unsafe, risking fire or shock hazards. We introduce the proper connectors used for aluminum wire below. This photo shows how electrical connections can burn up if you use the wrong device or do not make the connection properly. The proper way of making safe, secure splices is to make a good mechanical and electrical joint-that is, strong enough not to pull apart and tight enough so there is no loss of voltage. As this is tricky work, a continuous run of new wire is always better than any splice. Splices in electrical wire that carries electrical current in a building (such as for lights or electrical outlets) must be completed using an approved mechanical connector and must be enclosed in an approved junction box which itself is secured to the structure. In addition, the NEC and other electrical codes specify lots of precise details describing the number of wires of various sizes that can be enclosed in junction boxes of various sizes, where these boxes must be located, how they can be covered, etc. Our photo above shows an improper and certainly not code-compliant mess of pigtail splices in electrical wires. - Photo courtesy of Tim Hemm. Electrical wires that connect appliances, lamps, stereo equipment, etc to wall outlets should never be spliced for permanent use, but occasionally, it may be necessary to splice these wires when repairing or modifying appliances or for emergency repairs. 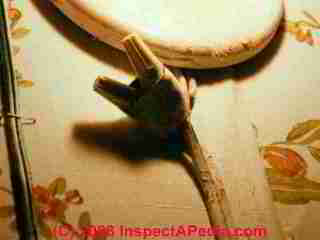 Our photo shows an improper, unsafe, and certainly not code-compliant splice in lamp cord used to wire a wall-mounted light fixture. Exposed electrical connections like this are a fire and shock hazard. Further, this is an un-approved use of lamp cord or "zip cord" to replace what should have been approved electrical wire, a junction box, etc. When we see exposed electrical work like this we know that someone un-trained has been doing electrical work on the building and we need to be alert for other faulty electrical wiring practices. Our our enlargement above and our page top photo shows a pigtail splice at the lower left of the drawing. Strip off at about 1 an inch of insulation from the end of each wire. When you are joining electrical wires used to carry current in a home you'll be using a solderless twist-on connector such as we show at left. In this case the length of wire from which you need to strip insulation depends on the number of wires being joined together and the size of the twist-on connector you're going to use. In good practice you don't want to strip off too much insulation - when the splice has been completed and the twist-on connector has been installed, you should not see any bare wire exposed extending beneath the bottom edge of the mechanical connector. 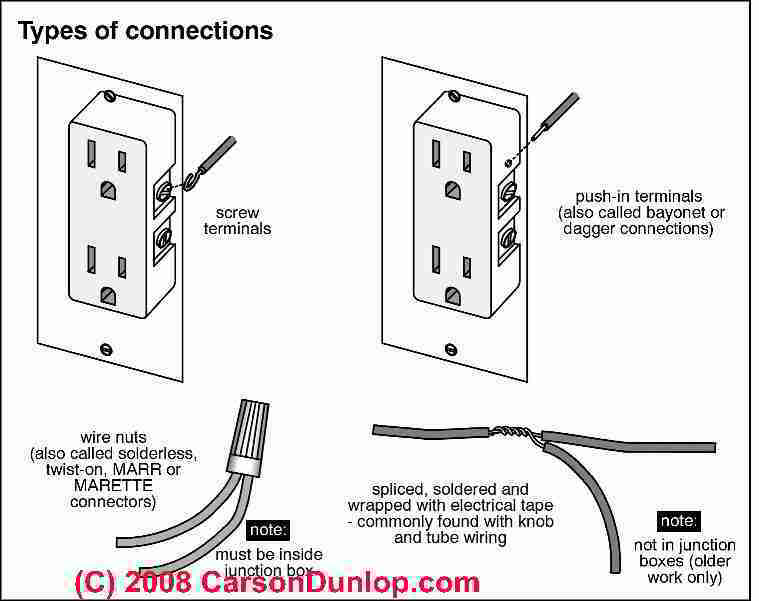 If you are stripping wires that are not part of the building's electrical system, such as speaker wires, you may not be using a mechanical connector, just tape, and the length of wire that you need to strip depends on the number of wires being joined and your ability to twist them securely together. Don't damage the wire during stripping of insulation: Be careful that you don't nick the metal wire when cutting the insulation in preparation to strip it off. 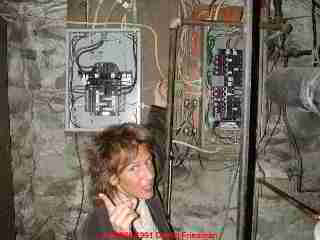 Twist the electrical wires together tightly starting at or near the first bit of exposed wire. Always twist the wires in a clockwise direction. That way when you screw on a twist-on connector (which also is tightened by turning it clockwise) you won't be un-twisting your wires. 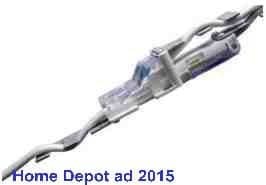 We describe just how we twist wires together for a twisted splice just below in this article. Trim off sharp points protruding from the end of the twist. Solder the twisted wires at the point where the twist began. Secure the completed electrical wire splice with an approved twist-on connector as we discuss below. Our photo above shows some pigtail splices inside of a metal junction box - in this case, because the wires are aluminum, the connectors shown are not the proper ones, and these splices are a fire hazard. The pigtail type of splice is best when joining three or more wires. The thing to guard against when more than two wires are involved in the twist is the tendency for one or more of the wires to remain fairly straight while the others are wrapped around it. 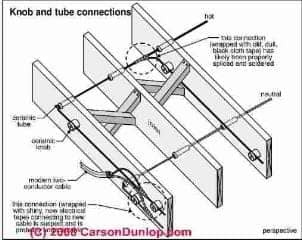 When this happens the straight conductors can be pulled free of the splice fairly readily. The way to prevent this is to make certain the twist is started with all the wires bent at approximately a right angle. (Don't bend current-conducting electrical wires at a sharp angle however.) Then if the bent wires are interlocked and held with pliers, the twist will continue as started. Starting a three-wire pigtail splice. To interlock all three wires bend each one at a right angle when you make the first twist. A straight wire will pull out under relatively little stress. Testing a three-wire pigtail splice. Check that all of your wires participated in the twist by pulling each individually. 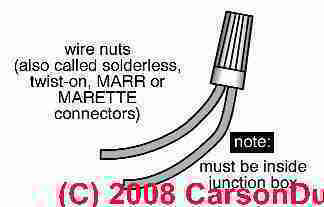 Make this check before applying your mechanical connector such as a twist-on or MAAR. Finish the three-wire pigtail splice by securing it with a mechanical connector as we discuss below. For light wire, such as stereo speaker wires, when two wires are joined, cross about two inches of each end of prepared wire. Bend the ends of the wires over each other at right angles and twist them around each other. For intermediate-sized electrical wires such as #14 copper wire (a 15-Amp electrical circuit) or #12 copper wire (a 20-Amp electrical circuit), you can usually strip about 3/4" of bare wire (special stripping tools are available that won't damage the wire or you can work carefully with wire cutters or a knife), and you can twist your wires together (clockwise) by holding the wires in one hand and twisting the bare ends using a single pair of pliers. For heavy-gauge wire, two pairs of pliers are needed to make sure the connection is tight. Use one pair of pliers to hold the wires at the beginning of the twist. The twist-splice in electrical circuit wires in a building must be capped or mechanically secured using an approved wiring connector. Also see SPLICING WIRES When Adding a Receptacle. Twist-on connectors come in different color-coded sizes, and you must choose the proper twist-on connector, depending on the thickness (gauge) of the wire and the number of wires you're combining in your splice. The connector is placed over the end of your twisted splice, pressed onto the wires, and turned clockwise until it is tight. Be careful when pushing an electrical splice back into the junction box - don't loosen the connector you've installed or your connection will be poor and possibly unsafe. Using the wrong type of electrical splice connector, or one for which studies have shown poor performance, can lead to a melted or failed electrical connection, possibly risking shock or fire. at How to Reduce the Risk of Aluminum Wiring. Electrical wires in a building are sometimes joined without twisting wires together. Instead we use special approved connectors. The AlumiConn TM connector shown here is used to splice a copper "pigtail" wire together with one or two aluminum wires as a step in reducing the fire hazard associated with aluminum electrical wiring. The AMP COPALUM connector (now sold by TYCO) is also used to connect copper to aluminum wiring, and is also discussed at How to Reduce the Risk of Aluminum Wiring. This connector must be installed by a an expert trained in aluminum wire repair and using a special crimping tool which forms a cold weld between the metals. Romex Splice Kits are plug-type devices that are designed to permit tapping and splicing of non-metallic electrical wire (NMC or "Romex" wire) outside of an electrical box. Among the building electrical wiring connectors discussed in this article, this is the only wiring device that is permitted for use outside of electrical boxes, as we elaborate below. 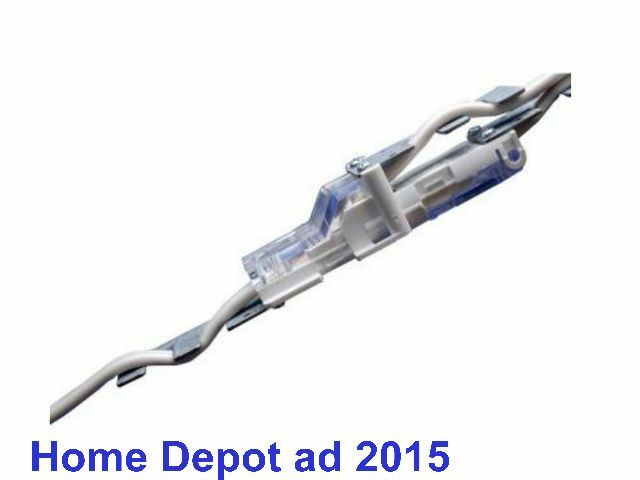 Reader Question: Is it safe to use Romex splice kits sold at Home Depot? Is it safe to use romex splice kits sold at home depot, so that 6 receptacles in a kitchen back splash can be lowered about 4" and realigned from vertical to horizontal? Thanks for the question, Robert. While I have not used the NMC wire splice kits you describe I've certainly seen them very widely used, particularly in modular construction where pre-wired home sections are set in place and then their electrical circuits need to be joined. The two images above illustrate two of Tyco's NMC splice kit models. 300.15 Where boxes or fittings are required, (H) Insulated Devices As permitted in 334.40(B), a box or conduit body shall not be required for insulated devices supplied by nonmetallic-sheathed cable. 334.40 (B) Devices of Insulating Material Switch, outlet, and tap devices of insulating material shall be permitted to be used without boxes in exposed cable wiring and for rewiring in existing buildings where the cable is concealed and fished. Openings in such devices shall form a close fit around the outer covering of the cable, and the device shall fully enclose the part of the cable from which any part of the covering has been removed. My understanding is shared by other commentators I reviewed including over at my friends at the JLC forum who noted in discussion that this connector was "legal" for use at least btginning in 2002 (with the 2002 NEC articles 334-40B, 545, 550, and 551. and continuing through the 2005 and 2008 NEC update cycles where these provisions were not changed. "Safe" is a more broad term used in your question than "legal". My OPINION is that the connectors are "safe" in the general meaning of that word provided that they are installed in accordance with the manufacturer's instructions and the NEC. Splice and Tap Kits also eliminate wire nuts for installation and replace the conventional method for adding a splice or tap for non-metallic cable without the need for exposed and unsightly junction boxes. NEC approved Article 334-40b. The Wago Wall Nut is a device which connects several wires of different gauges and types, as you can see in this photo. Lugs which use a screw to bind wire into a holding device, and bus-bars which use a similar approach are used inside of electrical panels to join multiple neutral or ground wires together or to secure large-diameter wires. Screw terminals are used on circuit breakers to secure electrical wires to these overcurrent protection devices. 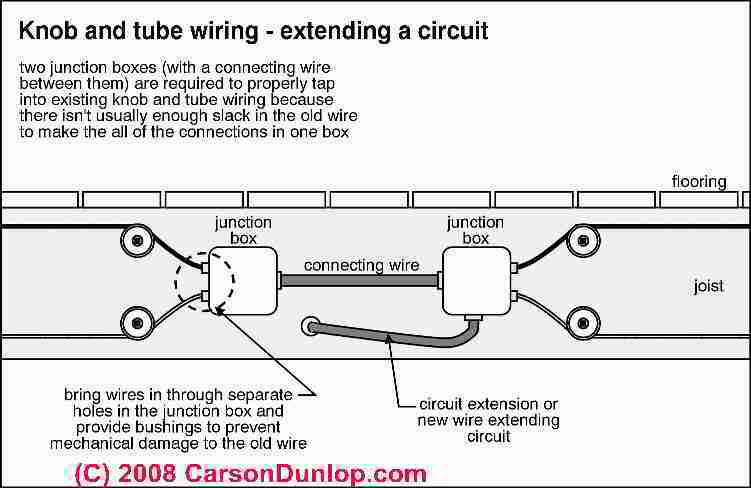 Sometimes it is desirable to join one wire to another at some midpoint without cutting the second conductor. The tap splice can be used in this case. What characterizes a tap splice is that one wires to be joined is not cut, but rather is kept continuous. 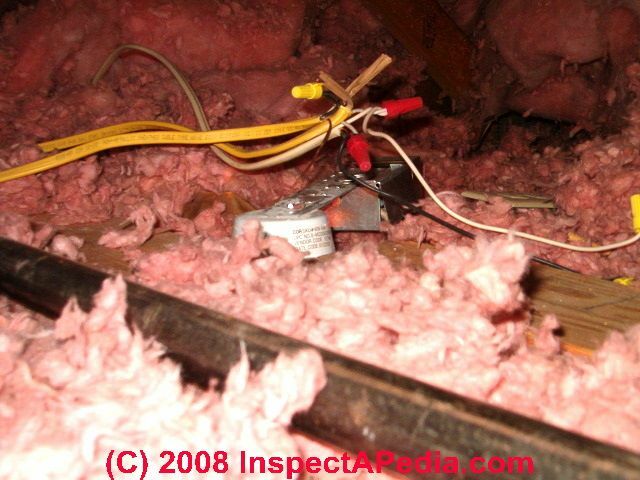 Remove insulation from about two inches of the continuous run wire. Wrap the joining wire tightly around the continuous wire. Solder and tape the spliced wires. A tap splice is shown in our page top sketch at lower right and again here. If the joining wire is stranded, such as speaker wire, the strands may be separated into two bunches and then wrapped in opposite directions along the continuous wire to form a more secure connection. Tap splices are not used in home electrical circuit wiring except for older knob-and-tube electrical wiring. Our sketch at left, courtesy of Carson Dunlop Associates, shows the usual ways that knob and tube electrical wiring is connected in homes. 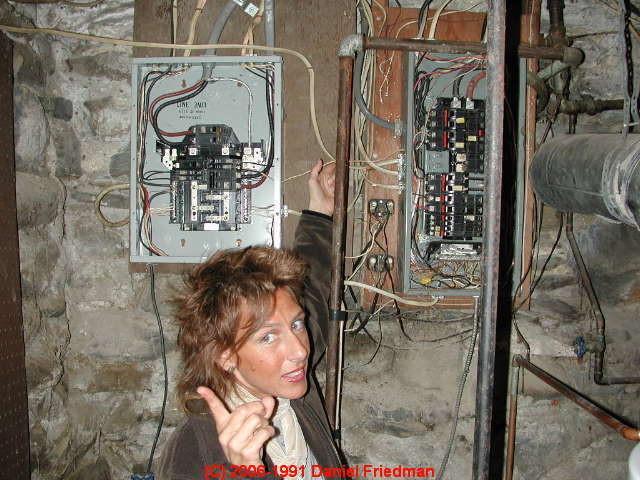 Knob and tube wiring connections were made outside of electrical junction boxes. In normal practice knob and tube wiring splices are soldered and also taped. We do not use plastic electrical tape on these installations, but rather the heavier cloth-based black electrical tape. 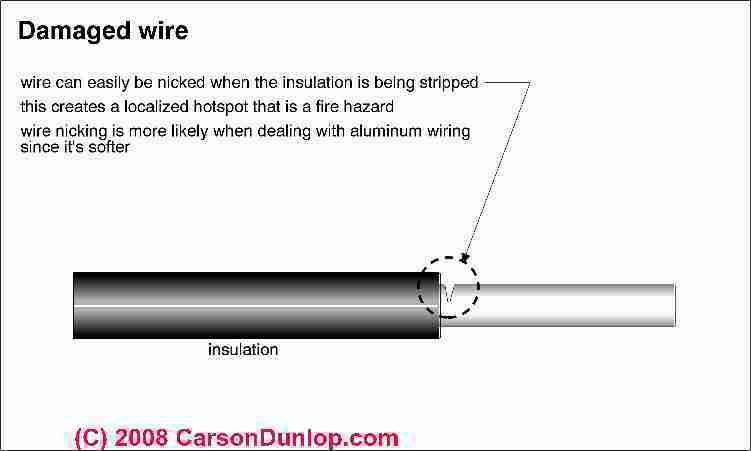 Review our discussion below to see when you can just tape electrical wire splices. In some jurisdictions (especially in the U.S.) knob and tube electrical wiring was code-approved and used into the 1970's or later. In most jurisdictions there is no requirement that knob and tube wiring be removed or replaced, but it is not permitted to extend a knob and tube electrical circuit - say by adding wires to connect additional devices like receptacles. If the knob and tube wiring system is not in good repair it may need to be replaced for fire safety. Watch out: in most jurisdictions it is not permitted to extend or add-on to existing knob and tube electrical wiring. When can you just "tape" electrical wires that have been spliced? 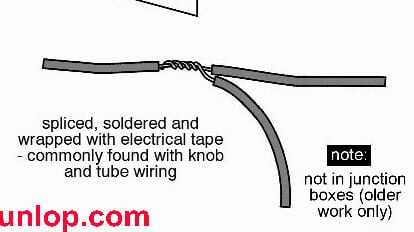 Wires used in the electrical circuit of a home are not normally joined using simple twist-together+ taping nor soldering + taping except where knob and tube wiring has been installed. 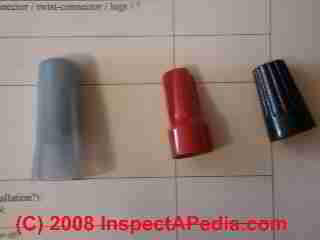 These joints are taped as described above. using ROMEX SPLICE CONNECTORS the connection should be within an electrical box. If your wires are not carrying any meaningful electrical current, such as stereo speaker wires, you can simply bend the wires parallel to one of the conductors and tape the bare splice from the end of the insulation on one side to the beginning of the insulation on the other side. Spliced and soldered wire splices such as in stereo wires should always be taped. The right amount of tape to use on a joint is the amount that will provide insulation about as thick as the original insulation on the wire. A good brand of plastic electrical tape is best for wire joints. How do we apply tape to a wire splice? Plastic tape sticks best if it is kept taut while wrapping. Continue the tape for an inch or so on the insulation at the other end. Make as many wraps as necessary to build the tape to the proper thickness. Cut or tear the tape at the end of the last wrap and press it smooth around itself. see ELECTRICAL WIRING COLOR CODES. Excerpts for the U.S. only are given just below. 120V / 240V A/C Electrical Wiring Color Codes & Conventions: U.S. In wiring a switch the electrican may use the white wire as a second hot conductor and will mark each end of the wire with black electrical tape. 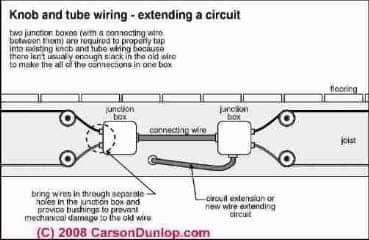 "Excepted voltage", these wires may be hot when main disconnect is switched off"
Continue reading at ELECTRICAL WIRE STRIPPING TIPS or select a topic from closely-related articles below, or see our complete INDEX to RELATED ARTICLES below. 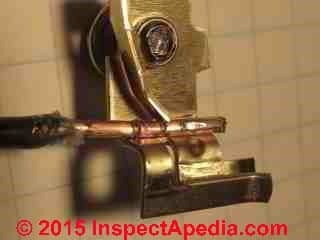 ELECTRICAL SPLICES, HOW TO MAKE at InspectApedia.com - online encyclopedia of building & environmental inspection, testing, diagnosis, repair, & problem prevention advice. 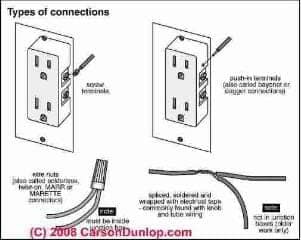 Questions & answers or comments about electrical wiring splices, connections, connectors.